The Elefante Volador is surrounded only by uncontaminated wild nature, 19 km drive from the 'hot' Tulum Playa . Amazing white sandy beach with nobody around. Every object in the house has its own story and soul; it was found and brought there. The house has its own personality that you can feel as soon as you step inside. Everybody falls in love with it: once there, they never want to leave! During my first Christmas there, I fell asleep listening to the soothing ocean sounds and the smelling the wind; these memories stayed with me for weeks after I returned home. The colors define spaces and volumes. Skilights and windows at each side, give a 360 view of the entire Sian Kaan reserve, and a small pool on the top terrace gives a breathtaking view of the nearby lagoon and towards the unforgettable sunsets. A very big round 'palapa' is the natural continuation of the inside towards the outside, with its spacious sofas, chill out areas and open kitchen. The sky over Tulum is a special. Some say it¹s closer to the earth. Actually, Mayan people were good astronomers! Lying down on the terrace, you feel that you can touch the stars. The house is wrapped around in natural features, and from morning to night you feel stunned by beauty. A walk along the bay takes about one hour and a half of strolling with your feet in the water. If you prefer to be still, you can lay on the hammock looking at the waves until dusk, and then you can move on to the terrace to watch the sun disappear into the lagoon. Herons, Pelicans, Frigate birds and Iguanas are our daily guests, as well as Panchita and Chakeron and the illustrious half-breed Mayan dogs. From May to September, the world¹s biggest Tortoises come to lay eggs on the seashore in front of the house. We counted 24 tortoises that came to lay eggs on our beach! 15 minutes North the house you can rent a boat to visit the lagoon and watch crocodiles, manatees, flamingos, eagles and Mayan ruins. cold and hot water , extra shower outdoor . The house is basically on the beach, from the living room to the sea will be just 5 steps ! the outdoor living room is plenty of seats, sofas and pillow very nice and cool area to play, rest, reading and nap .... we have one hammock to ..
we have Leticia the caretaker she will clean after you ! Very well organized dishes and utensils , everything you need in order to have nice meals .. This is an extraordinary part of the world and Villa Elefante is in a prefect location to explore the biosphere. It is about half way between Tulum and Punta Allen. We took a day trip to Punta Allen and had a wonderful seafood lunch in this small fishing village. However, you are best to rent a 4x4 to make this trek. The beach is secluded and calm, the villa is located midway on a small bay. The grounds are landscaped and well maintained. We didn't see another soul on the beach. Plenty of beach chairs, hammocks and netted lounging beds to enjoy the outdoor experience. The villa is simple but with architecturally sophistication. It is tastefully decorated and full of interesting artifacts with two bedrooms downstairs and one up. Roof top deck for reading or lounging after shower. The house is well kept, clean and everything works. The caretakers visit often to check on any needs you may have. They are very friendly and accommodating. Overall, this was great experience. The logistics were simple and relaxed. No problems, no complications. Thank you Joanne is a pleasure to have you as a guest ! Leticia and Felipe were wonderful caretakers/cooks. Yes, the drive is somewhat lengthy, but is part of the fun. The house is very artsy with great different environs to hang out. The only problem, and it’s a considerable one, is that the entire Riviera coast was innundated with sargasso weed which prohibited beach usage in front of the villa and beyond; a beach walk was not possible. We were able to travel to clearer areas however. We brought our snorkeling equipment and never used it. Still, we would not hesitate to go back. but only if the weed situation is not present. Thank you Martin , was a pleasure to have you as a guest ! An amazing property in front of the beach. The house has a simple and refined decoration with beautiful objects and fabrics from all over the world . You can lounge everywhere, from the living room with lots of multicolor pillows to your private paradise beach. I have never experienced in my life such a soft sand. My favourite spot is the terrace where you can see the sunrise and sunset light. Speechless. The best experience so far, is to swim alone within a 4 km bay, no visible neighbours and the house stands alone on the beach. It looks like a real miracle. No people around. Just this lovely home where you can have a hot shower and in the meanwhile listen to some good music with good internet signal ! Definitely the place to be in the Sian Kaan Bio Reserve. I often swim alone in the bay and i think exactly the same ! So please you enjoy ! TULUM'S ELEFANTE VOLADOR IS PARADISE COME TRUE. FROM IT'S BREATHTAKING VIEWS OF THE CARIBBEAN TO THE SECLUDED LOCALE, THE WARM AND WELCOMING STAFF AT THIS PRIVATE VILLA MADE FOR AN UNFORGETTABLE HONEYMOON. THANK YOU GIULI CORDARA, WE'LL BE BACK! been surrounded by pure nature and a beautiful beach, feeling at home since minute one in the house, having a magical energy surrounding us and the most amazing caretakers ever that with their genuine smiles made me feel part of the "family" were just a few details of this wonderful experience. It is located in a remote area and the road is very hard but those certainly play in favor, otherwise you would be just in another "tulum playa" location with people driving up and down and invading your beach. The feeling of looking right and left in the beach and seeing endless nature is just priceless. Thank you Giuli for everything and a big "see you soon" to Filipe and Leticia (pancha and jackas _ the beautiful dogs), we will be back in few months!! The Villa is one of the few in the Sian Kaan UNESCO biosphere, pristine wild nature, birds, nesting turtles in front of the villa, parrots, very close to the Maya Ruins. 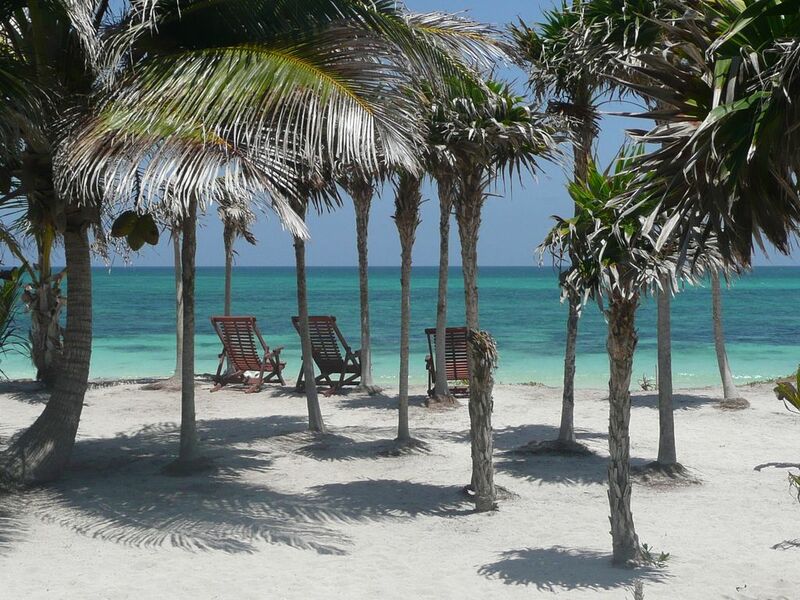 40/60 (depend on the road status) minutes drive from the super hip Tulum Playa, live music, good food, lounge.